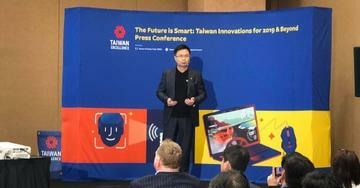 Paving the way for the future, Taiwan’s top innovators — CyberLink, ELECLEAN, Innolux, and Thunder Tiger — unveiled a lineup of transformative AIoT products at yesterday’s press conference at CES 2019, organized by the Taiwan External Trade Development Council (TAITRA), Taiwan’s foremost trade promotion organization. These technologies extend far beyond classic consumer electronics to our everyday experiences and include a highly precise AI facial recognition system, a futuristic underwater drone, a smart digital shelf display, and a portable sterilizer device that turns water into disinfectant. The 2019 press conference also featured an address from Taiwan’s Ministry of Science and Technology Deputy Minister Yu-Chin Hsu highlighting the Silicon Island’s tech arena. “With the emergence of AIoT technologies, we are leveraging our strengths and offering integrated AIoT solutions for smart living, smart homes, smart transportation, and smart retailing,” Hsu said. These Taiwanese ICT companies, all Taiwan Excellence award winners, generated a lot of buzz with the unveiling of their new products at the conference. CyberLink showed off FaceMe, one of the world’s most highly precise AI facial recognition systems. Senior vice president of global marketing Richard Carriere explained that with information available in real-time, FaceMe is ideal for use in smart security, smart retail, smart offices and smart cities. And its AI facial recognition engine runs smoothly on systems with less memory or with lower CPU/GPU computing power, allowing deployments into a price-sensitive mass market. ELECLEAN demonstrated its engineering and research prowess as Dr. Chien-Hung Chen, unveiled details of the world’s first green disinfectant generator. ELECLEAN’s Disinfectant Sprayer is the first ever portable sterilizing device that transforms water into disinfectant, eliminating bacteria and viruses. It serves as the perfect tool in cleaning the environment and disinfecting the human body. Transforming the retail experience is Innolux with its electronic shelf display. President James Yang demonstrated how these new shelf displays can replace traditional point of purchase or pop-up signs – reducing labor cost and saving time in changing out posters. Another innovation, and one that garnered smiles at the conference was Seadragon XLR, a next-generation remote-controlled underwater robot and submarine. Gene Su, general manager, explained that Seadragon which is designed for surveillance, research and research can explore to depths of 100 meters. It has highly maneuverable thrusters and quick-swappable batteries. A large audience of media and industry representatives participated in the event, Q&A sessions and networking opportunities. At least 105 attendees from 15 countries were present. Meanwhile, a global audience of almost 20,000 joined in, watching the livestream online. Throughout CES 2019, more than 200 Taiwan exhibitors presented their latest innovations. The TAIWAN EXCELLENCE Pavilion showcased 42 innovative products from 18 companies honored by the TAIWAN EXCELLENCE Awards. More than a quarter of the showcased products highlight the latest technologies in AI and IoT.